Arsenal are set to take on Sunderland in what was their game in hand and it give them oppertunity to close the gap between them and other top four hopeful Liverpool by just 1 point going into the last weekend of premier league football. Arsenal will be hosting Sunderland at Emirates on Tuesday, 16th May 2017 and the game will kickoff at around 20:00 uk time. If you missed the live action, we will have extended match highlights just after the match is over. 72′ 1 – 0 Alexis Sanchez scored in 72nd minute of the game to put Arsenal in lead after they missed string of chances. Arsenal has close the gap between them and top 4 teams with 3 important back to back wins and if they win against Sunderland tonight it will get them just within a point of Liverpool who have 73 points. Assuming Arsenal win their game against Sunderland it will put pressure on Liverpool to must win their last game and anything can happen from here on. However Arsenal do rely on Liverpool’s slip up as If Liverpool beat Middlesbrough on final day of the season they will qualify for Champions League football regardless other results. 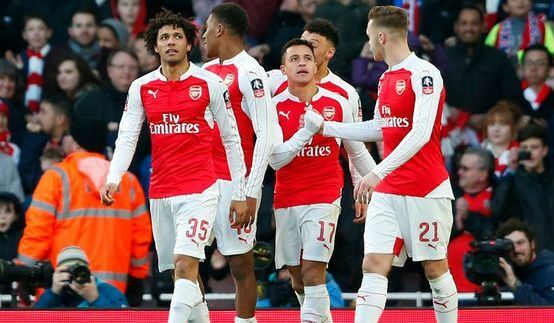 19′ 0 – 1 Alexis Sanchez scored in 19th minute to put Arsenal 1-0 in lead as Arsenal dominated the game for most part. 65′ 1 – 1 Jermain Defoe scored midway through second half to bring Sunderland back into the game. 71′ 1 – 2 Olivier Giroud came on as second half sub to put Arsenal back in the lead as floodgate opened. 76′ 1 – 3 Olivier Giroud was at it again as he grabbed his second and Arsenal’s third of the day. 78′ 1 – 4 Alexis Sanchez made it 4-1 and pretty much settled the tie. Jermain Defoe set to start upfront and he will be the key man for Sunderland if they were to get a result, while a packed 5 man midfield of Khazri, Cattermole, Kirchoff, M’vila and Fabio Borini will be looking to counter Arsenal possession play. This is how I expect both teams to lineup on Sunday afternoon. Predictions: Arsenal often started the season well than struggle for consistancy by new years time and than again pickup the pace towards the end of the season. This has been the theme for best part of last 10 years and this year is no different. Arsenal are in a spot of bother as far as their top finish is concerned, they are currently fourth with 63 points, 4 ahead of United who are fifth and this game holds massive importance as a defeat here will give United an opportunity to close the gap while Arsenal still have to play Man City. 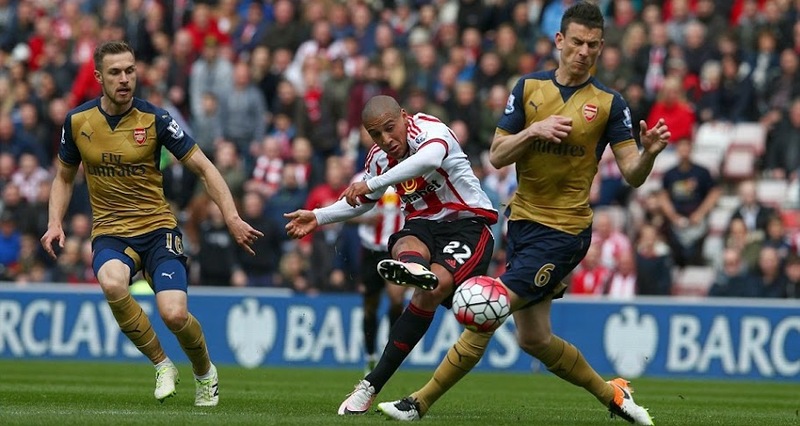 Sunderland fighting for survival will sure give it a good go and I can see them getting someting out of this match. Black Cats climb out of the relegation zone with a game in hand compared to both Norwich City and Newcastle United and that kind of put them in a good position to survive premier league with just three more games to play for. Arsenal failed to take full points against Sunderland in the premier league game which leaves them just level on points with Manchester City and 5 ahead of Manchester United who are fifth in the table. It was a pretty decent point and Arsenal just need to win 2 of the last 3 games to ensure champions League football next season. Arsenal played better in the first half against Sunderland but had to dig deep at times in second half to see off the challenge from black cats who themselves move out of the relegation zone into 17th place with a hard earned points. Arsenal and City are now just 5 point ahead of Manchester United while red devils still have a game in hand which put fourth place on the line since Arsenal will play City at Etihad in couple of weeks time.